"Great location by the slopes, great room for a family of 4, good breakfast, friendly staff, parking in front, overall nice hotel facilities"
The cozy and elegant Hotel HG Maribel is in the middle area of the ski station of Sierra Nevada, in the province of Granada. It’s a charming accommodation that has been renewed in 2004, in an Alpine and unique style. The accommodation has 31 rooms that are either double, junior suites or suites. All of them are equipped with a private bathroom, a digital television, a safety deposit and a mini bar. Among the services the hotel provides and the facilities at our property, there is adapted access for the handicapped, a restaurant, bar-cafeteria, game room, laundry service, ski storage, and free shuttle to Plaza de Pradollano (with an established schedule). Those who are looking for relaxation and want to disconnect from urban life can enjoy the solarium, the Jacuzzi, sauna and massage service. The most adventurous travelers can hop into their skies and start skiing right from the hotel’s exit door. It’s a perfect accommodation to enjoy a break or to practice winter sports. 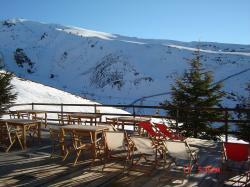 We are located in the ski station of Sierra Nevada, the best meeting spot for snow lovers. The city of Granada is just 33 km away from the accommodation. -Cancellations on reservations will not be charged if they are made 2 or more days in advance to the date of arrival to the property. -In case of cancellations made with less than two days in advance the first night’s fee will be charged. -Cancellations on the date of arrival or no show will be charged with the 100% amount of the price of the stay at our property. All of this apart from the guarantee down payment. In order to amend a reservation, please contact the hotel directly. Its details figure on the voucher. If by amending your reservation the number of nights or rooms you have booked is finally reduced, the deposit will not be refunded and will not be discounted of the modified reservation fee. "Ski in, ski out. 10mins walk down to pradollano. Room was great and helpful staff. No extra cost for parking. Have stayed here before and will return." "Breakfast is not the best and should have wifi in the rooms." good if you are complete beginner." "Ski lifts closed on second day so had difficulty getting back to hotel. Eventually got taxi which cost 10euro. Would have been too difficult to walk with skis. Got hotel at reasonable price, advertised price 900 euro, def not worth this. Not 4 star." enjoyed it thanks to everyone. The staff in the restaurant were amazing.